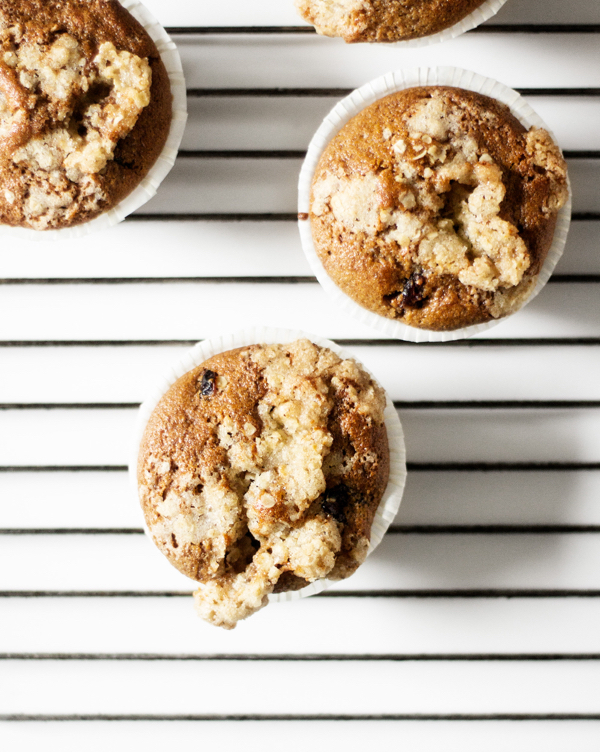 On the second day of Christmas, my true love gave to me…sour cream and cherry muffins! 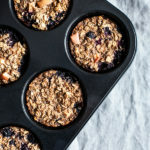 Specifically, vegan sour cream muffins with dried cherries and an oatmeal crumble topping. Not a bad way to celebrate the end of a long week, nor to welcome the Christmas season officially. 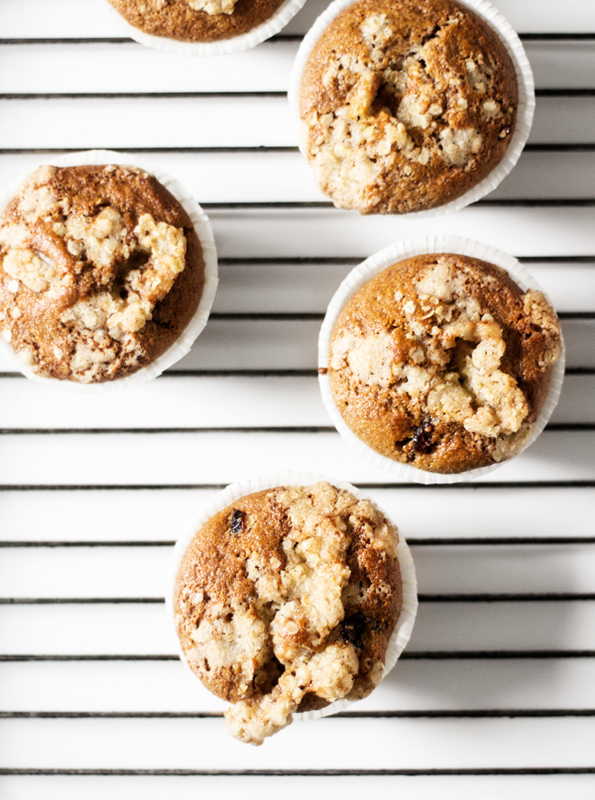 These muffins are delicious, and easy, but they’re also a wonderful idea for edible giving and festive brunch entertaining. 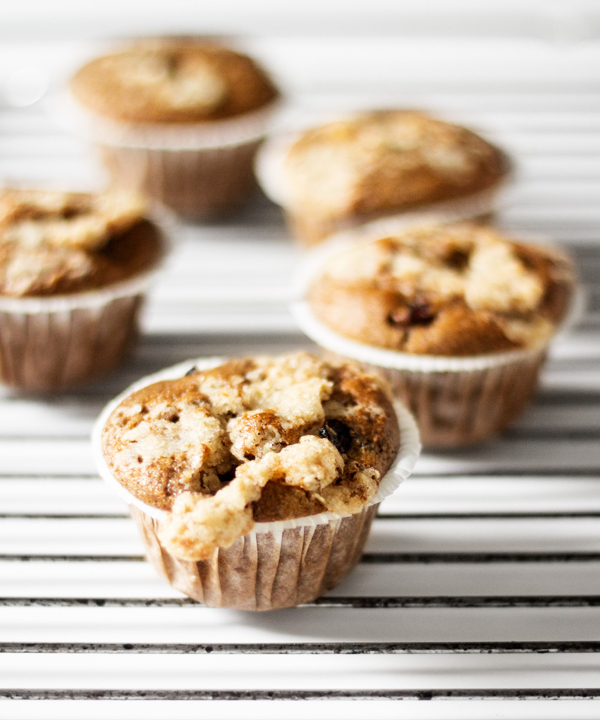 Best of all, they’re 100% vegan, and they’re full of healthy little twists on traditional muffin recipes, including the fact that I made them with spelt flour and cashew cream in place of dairy. Preheat the oven to 350F and line or lightly oil a muffin baking dish. Combine the flour, baking powder, baking soda, flax, salt, and cinnamon in a large bowl. In another bowl, stir together the cashew cream and lemon juice. Stir in the oil, milk, maple syrup, and vanilla. Pour these wet ingredients into the dry ingredients, and mix until just combined. Fold in the dried cherries. Pour batter into the prepared muffin tin; I recommend making about 8-10 muffins, so that they're a good size. To make the crumble topping, simply process the butter, sugar, flour and oats in a food processor till they're crumbly, or use your fingers to crumble them. 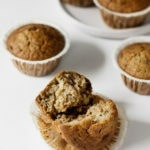 Sprinkle on top of muffins, and bake them for about 18-22 minutes, or until they're golden brown and a toothpick inserted into the center of one comes out clean. Serve for breakfast, and smile. 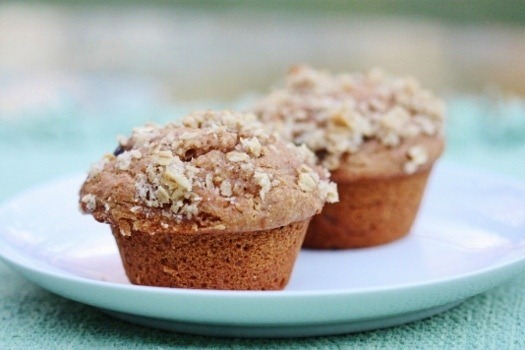 These muffins are so, so moist and delicious! I love how the cherries add tartness while also adding sweetness—it’s a nice alternative to the more commonplace dried cranberries. I can’t recommend these enough as a holiday treat—or a treat for any time of the year! 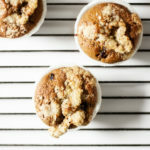 Whether for a sweeter breakfast or as a mild dessert, these muffins are a joy. Does any holiday cooking lie ahead for you this weekend? I’d love to hear about it. In the meantime, happy Friday. I don’t have any cooking this weekend, unfortunately, just preparing for final exams…boo! Well, I guess working at a vegan restaurant tomorrow sort of counts even if I don’t actually make any of the stuff, I still like to nibble it! Anything with dried cherries is bound to be good. They are one of my favorite foods! These sound so grand , I must make muffins this weekend. I think I will be baking muffins & cookies this weekend. 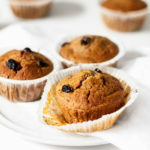 These muffins look great. My mom and grandma always taught me to “use up” that little bit of sour cream left in the container in baked goods if you have it on hand b/c it makes things moister without imparting tons of flavor (or any) generally. Your homemade tofu sour cream idea is fabulous. Good tip! These sound great. I’ve been totally obsessed with dried cherries lately… eating them in my oatmeal every morning and enjoying a handful in the afternoon when my blood sugar takes a dive while studying. I will definitely have to try out this recipe. Thanks! those muffins are rockin! I love that you made your own sour creme too; the packaged stuff is so wack. Ahhh! This recipe is awesome for Australians because cherries are in season here and cherries are totally the Xmas thing here. Having a bowl of cherries at your family barbie while enjoying the sunshine is so Australian. I am so making these! I even have a big bag of cherries in the fridge – perfect! I just made this and I LOVE them!!! I made mine into a cake and baked for an extra 15 minutes at the same temperature. I used 1.75 cups whole wheat flour and .25 cups plain flour. I also used fresh cherries and used probably about 1.75 cups instead of just 1 because I wanted my cake to be overflowing with fresh cherries! I highly recommend saving this recipe for summer because the fresh cherries are awesome in it. I would even add more cherries next time, maybe 2 cups. And I would add walnuts next time too, so that there’s more going on in it. 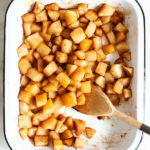 I was cringing as I was making this, because agave nectar is so expensive here in Australia and the recipe calls for a lot – but it is so worth it! Yummy, thank you for the recipe! Any suggestions for a “sour” cream if one cannot eat soy? These look delicious and I would love to make them. I was going to bake brownies for a party this weekend, but I think I’m going to be up late painting instead. These muffins look fabulous though! I love anything to do with cherries, or muffins. Ah these sound delicious! And I currently have an entire packet of dried cherries just waiting to be used up. I fully intend to pick up some spelt flour today and make these ASAP. Thanks for the recipe Gena, every baked good of yours that I’ve tried has always turned out wonderfully. These look amazing! By the way, I’m interested in making a few flavors of kale chips this weekend. I’ve made the tomato tahini (amazing!) and will probably try the spicy curry ones this weekend. Do you have any others on the site you recommend? Thanks so much!! I just made these and scoffed 2 out of the oven. SO nice!!! Agree with Gena, the cherries definitely give them something that you wouldn’t get with cranberries. The magical properties of tofu strike again! I always find my muffins to be a little on the dry side two or three days post baking, but I’m sure with these, that won’t be an issue. ‘Are kamut and spelt safe alternatives to wheat? No. Kamut is a cereal grain which is related to wheat. Spelt is an ancient wheat that has recently been marketed as safe for wheat-allergic individuals. This claim is untrue, however. Wheat-allergic patients can react to spelt as they do to common wheat.’ (Source: The Food Allergy and Anaphylaxis Network). You are VERY right, Laura! I just read up on this. Thanks. will edit. hahaha ‘digests as a vegetable’? Anyway, these look gorgeous. Love anything with dried cherries, so thanks for the recipe! These were delicious and my house smelled amazing as they were baking! i was trying to use up stuff in the pantry, so substituted canned cherries, and unsweetened soy yogurt for the sour cream… they turned out great!! i was really excited to try out spelt – it was easier on my stomach than typical flour. Love that crumb topping, too. I made these this weekend – 2 thumbs up! I brought some into work for my non-vegan friends and they were a big hit. On a side note, I just made a batch of banana soft serve for the first time and my life is forever changed.